It is good to be back. I spent the last week out of town visiting with my husband’s family. We had a great time, but it’s always great to return home. We are trying to get back on schedule after vacation and getting through our laundry. It is always lame to come home and have suitcases full of dirty laundry. Oh well, what can you do. 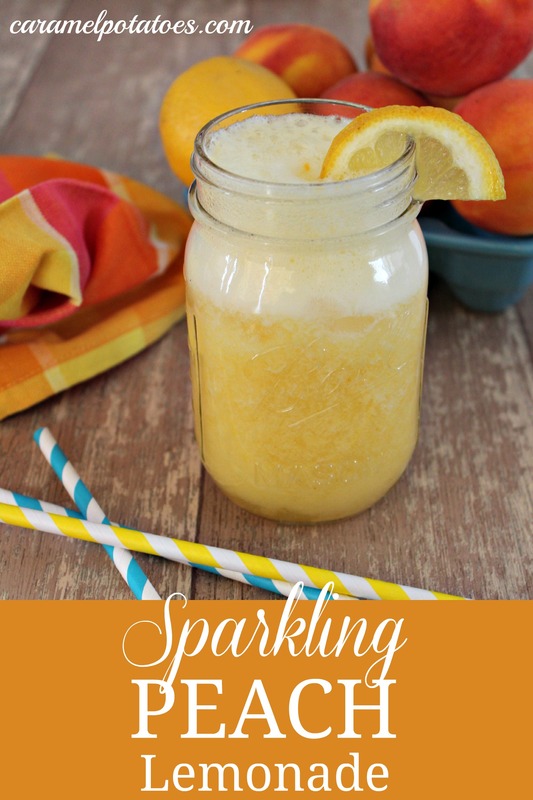 How about sitting out on the front porch with a glass of this Sparkling Peach Lemonade. That is where you could have found me last night. I love sitting outside with my family relaxing on a cool evening. To make peach puree, first peel peaches and then cut flesh from peaches close to pit. Add peach pieces to blender and puree until smooth. Using blender, stir in the lemon juice and sugar. Pour puree into a pitcher and slowly add the sparkling water, stir to combine. Pour into glasses filled with ice. Makes six 8 ounce servings. This looks delicious, I need one of these soon! I love anything peach! Looks so refreshing. Looks sparkly and peachy. Thanks for sharing at Thursdays Treasures, I’m featuring you this week.